Palnut® Capped Washer Self Threaders - Bolt Products Inc.
Non-Threaded Applications Palnut self-threading nuts and Pushnut® fasteners are respectively turned on and pushed on non-threaded projections, or studs. These capped washer type self-threaders eliminate the cost of cutting threads and the problems of cross-threading. They permit simpler, more economical and ultimately better designs. With these fasteners, there is no thread to find and no binding from dirt or damaged threads. 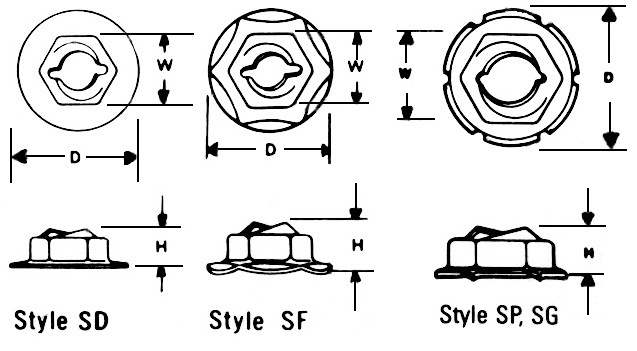 Because of their prevailing torque, capped washer type self-thread fasteners provide excellent vibration resistance. Stud materials, which must be appreciably softer than that of the fasteners, include die cast zinc, aluminum, molded plastics, steel and brass.